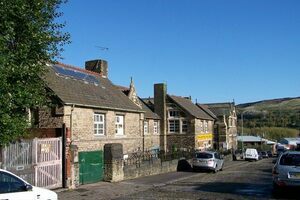 It’s been many years since young children passed through this old school. Though it’s now a bustling community center, it’s best remembered as the backdrop for a beloved British comedy film. This school building was used for several outdoor and indoor scenes in the filming of the 1997 movie The Full Monty, where a group of unemployed Sheffielders, including four former steelworkers, decide to make some money by becoming striptease artists under the name "Hot Metal." Notably, the building was used for the highly popular "dole queue" scene, where the crew of budding strippers dances to Donna Summer's "Hot Stuff" played in the PA system while waiting in line to sign on for their social security payments. And as life sometimes imitates art, the school is now partly used as a training center to help unemployed people learn such things as interview skills and resumé writing. This current use mirrors a hilarious scene in the movie based in a "job club," one of the schemes originally set up in the United Kingdom in the 1990s in response to the high unemployment at the time (which was the basic premise of the movie). The movie (controversially) won an Oscar for the Best Original Music Score and was nominated for Best Film, Best Director, and Best Original Screenplay. It really got to the heart of the social situation in Sheffield following the near total collapse of the steel industry. For Brits, and Sheffield people in particular, it remains a firm favorite. The Sheffield accent can be difficult to understand so in many movie theaters, translation cards were issued prior to the start of the movie. This resulted in several humorous suggestions that it should get an Oscar nomination as a foreign language film.